WPBS-TV is pleased to announce the screening of “Painting with Wilson Bickford Season 4”, Thursday, January 11th at 6pm in the WPBS Community Room, located at 1056 Arsenal St., Watertown, NY. This screening is free and open to the public. The episode being screened is titled, “Approaching Storm”, in which Wilson demonstrates how anyone can create mood and character in a stormy sky. Following the screening, WPBS will be holding a special Paint and Sip Event from 6:30 – 8:00pm. With your paid ticket, you’ll enjoy creating your own masterpiece, entitled “Morning in the Adirondacks” under the instruction of Wilson. The evening will also include refreshments and wine. Tickets are $55 per person and are available to purchase at wpbstv.org/tickets. Seating is limited, so purchase your ticket early. If you can’t attend the event, WPBS-TV will live stream the class online at wpbstv.org and on Facebook! Painting with Wilson Bickford, Season 4, is a 13-episode series featuring a variety of different landscapes and studies sure to interest both the novice and experienced artist. Wilson Bickford is a nationally known artist and instructor, who has conducted painting workshops for over 20 years. Primarily a self-taught artist, his easy-going style has earned him thousands of satisfied students, thus proving his philosophy that “ANYONE can learn to paint”. He works in acrylic, watercolor and pen & ink, with oils being his personal favorite and most requested workshop medium. His painting tutorials on YouTube have received millions of viewings and he is the author of “Wildlife Landscapes You Can Paint” (NorthLight Books). “Painting with Wilson Bickford” Season 4 will begin airing Monday, February 19th at 1:30pm. “Painting with Wilson Bickford” Season 4, will also be offered to other PBS stations across the country. 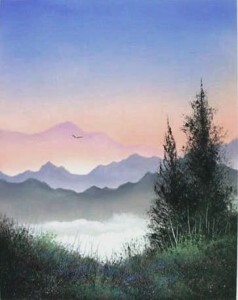 If you would like to purchase earlier seasons of Painting with Wilson Bickford or any of his Technique DVDs, they are all available to purchase at wpbstv.org.